We warranty our 4x4, 4x6 and 6x6 post caps for 10 years against fading, warping and discoloration. Our Pile Caps are warrantied for 3 years. We offer a 30 day no-hassle return policy. Please call us to schedule a return BEFORE shipping your product back. Orders returned after 30 days will incur a 15% re-stocking fee. This helps us cover the additional cost we incur for refuding aged orders via the payment companies. We offer several styles of post caps. Most of our pyramid, flat top and slim profile post caps are made out of ASA resin, which is an outdoor, UV resistant plastic. This plastic material is used in automobiles and marine vehicles, and will withstand extreme temperatures. 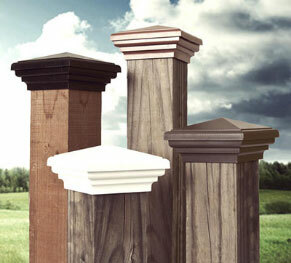 We also offer many die-cast aluminum post caps, some of which are powder-coated in a durable outdoor worthy color. Can my post caps be painted? Yes, our caps can be painted any color you like. We suggest using Krylon Fusion Spray Paint, but any plastic ready spray paint will work. Where are your caps made? We manufacture our line of post caps here in the United States. How do I install my post caps? Atlanta Post Caps are easily installed in two peices. Attach the base to the post with the installation tabs on the top. Secure the base with decking screws, and SNAP the top into place. Be certain you are ready to install, as they are designed to stay on under harsh conditions. The tops are not always simple to remove once they are installed. We have negotited rates with our shipping carriers and are able to offer highly competitive shipping rates. Orders placed Monday - Friday before 2pm (EST), will usually be shipped out the same day. Please note: Free shipping is not available to Alaska or Hawaii. What are the dimensions of the post caps? The base of our post caps slide down the post 1.5", except on the Economy models, which only slide down 3/4". How wide are the post caps? We accept all major credit cards, paypal and checks. If you would like to pay by check, please call to place an order by phone. What do Nominal and Actual mean? Are my fence/deck posts Nominal or Actual (True)? If your posts are less than their named dimension (I.E. less than 4x4, 4x6, or 6x6) you have a Nominal post. If they are equal to or greater than their named dimensions, you have an Actual or True post. The easiest way to be certain is to measure! If you've recently purchased 4 in. x 4 in. wood from a home supply store, you've most likely got a piece of wood that is actually 3.5 in. x 3.5 in. which is a nominal measurement. Be sure to measure if you have any doubt! When you see the word 'Nominal' next to lumber sizes, it means that the actual dimensions of the wood are smaller than what the sales name implies. While we don't currently have a traditional retail space, you are welcome to come by our offices and complete your purchase there. Please be sure to call us prior to coming to verify that we are in the offices that day! Yes, we do! If you are an established reailer or distribution channel, we would love to speak with you. We are especially interested in partners in Canada and Australia. Please note, we only offer wholesale in quantites of 1,000 caps and higher. Can I cut/trim my post caps? If you have a post that is too close to a wall, you can use a fine tooth saw blade to cut our ASA Resin post caps to fit your particular need.